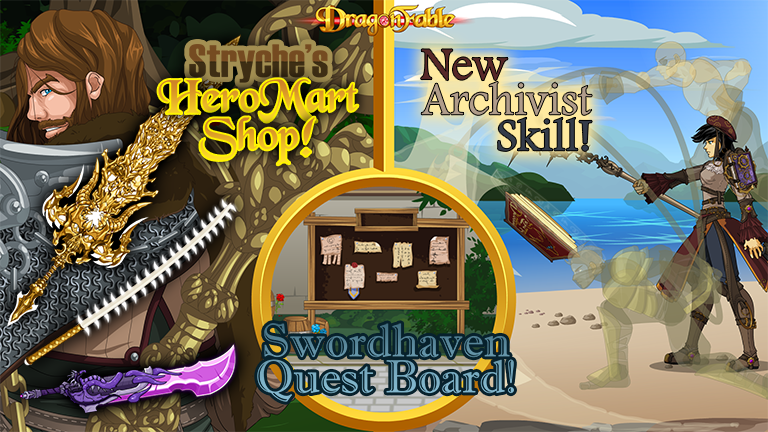 DragonFable - Design Notes: HeroMart, Archivist, and the Swordhaven Quest Board! HeroMart, Archivist, and the Swordhaven Quest Board! This week's release is live! First off this week, we have Stryche's new HeroMart shop! Starting with the AQ3D t-shirt next week, When you purchase specific (not all- make sure you check!) REAL LIFE items from HeroMart, you'll get a code that you can redeem online for HeroPoints in each of your favorite Artix Entertainment games! What can you get with HeroPoints? You'll be able to buy powerful weapons and items, as well as special classes! This week, we're releasing 3 weapons for 2 HeroPoints each, as well as bringing back and giving a small update to the Shadow Base Classes (5 HeroPoints each). These Shadow Base Classes are NOT base class locked, which means you can purchase and use the Shadow Mage class even if your base class is Warrior! The next Archivist skill is now live! Using what you've learned from the furious and dirty fighting of pirates and ninjas, you can now empower your attack to add a damage over time effect! Citizens have started posting quest requests on the Swordhaven Quest Board! Are you Hero enough to help out the people of Swordhaven? This week's release presents a new equippable item type- the bracers! These items give small stat boosts, and are equippable in their new slot. Although Bracers are usually for higher level characters, the Shadowheart Bracer is usable by all characters (even without a Dragon Amulet)! It is also the artifact for Shadow Base Classes. Shadow Base Classes are unique in that they are able to use two artifacts: both the Cloak Scrap Artifact and the Shadowheart Bracer. The Shadowheart Bracer will boost damage done by the Shadow Base Classes by 50%! Even if you don't have the Shadow Base Classes, you will still be able to use the bracer for its stat boost! The Shadowheart Bracer has a 10% chance to drop from any of the current Caitiff saga quests (besides Breaking Down). Make sure your browser doesn't block DragonFable!